Manchester City strike force: What would Van Persie’s arrival mean for Balotelli, Tevez and co? After securing a last-gasp Premier League title success last season, Manchester City were expected to push on and splurge in the transfer market, as they look to challenge on all fronts next term. However, despite a slow summer to date, Robin van Persie’s admission that he will not extend his current deal at Arsenal has triggered Roberto Mancini’s interest. Although other sides are also circling and Arsene Wenger is by no means guaranteed to sell, what would the Dutchman’s arrival at the Etihad Stadium mean for City’s other strikers? The diminutive Argentine forward took to the Premier League in his debut season like a duck to water, and scored the division-winning goal in injury time on the last day. Despite reported Real Madrid interest, the South American has pledged to stay with the English champions, and Mancini has no intention of selling him. 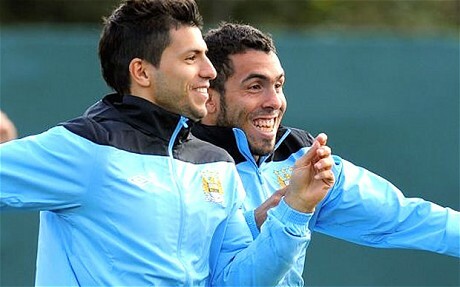 Van Persie’s most likely strike partner, Aguero is the one attacker at City assured of a place and his future. Controversial, petulant but brilliant, Carlos Tevez had quite the 2011-12 season. Initial transfer requests, a refusal to come off the bench and a prolonged AWOL period back in Argentina meant that the forward’s time in England looked over. However, after an apology, Mancini reinstated Tevez in his side and the ex-United attacker has stated that he is now happy at the club. Despite this, Van Persie’s arrival would surely restrict Tevez’s opportunities and break-up his partnership with countryman Aguero, which could well lead to more ill-discipline and problems for City. Despite at times looking lethal in front of goal in 2011-12, the Bosnian has slipped down the Etihad Stadium pecking order and looks certain to be sold. Van Persie’s arrival would mark the end of Dzeko’s City career. The most interesting scenario of the four, should Van Persie arrive at City real questions over Balotelli’s future will be asked. One only has to look at how the temperamental attacker acted when dropped by Cesare Prandelli at Euro 2012 to see his thoughts on not playing. Balotelli needs attention, to feel loved and to be centre-stage; Van Persie’s arrival would mean a lot of bench time for the Italian, and a pain in the neck for Mancini. Van Persie would be an asset to any team, and certainly be a signing of intent by City. However, with a number of other big egos and outspoken characters vying for a place in the side’s attack, Mancini’s man-management skills would be stretched to breaking point. With Tevez, Aguero and Balotelli staying, is there room at Manchester City for Edin Dzeko? Manchester City have played some scintillating football over recent weeks to retake the top spot in the Premier League, with only 180 minutes between them and their first top-flight title since 1968. One of the reasons for this upturn is seemingly the return to the team of Carlos Tevez, and his relationship with countryman Sergio Aguero. 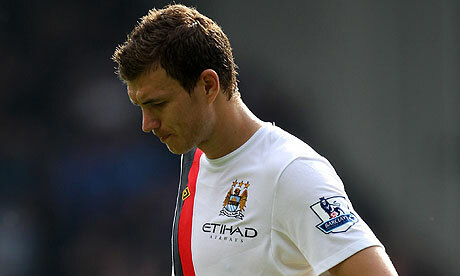 However, with Mario Balotelli still in the picture also, what does the future hold for Edin Dzeko? The Bosnian has had contrasting fortunes during his time at the Etihad Stadium. A slow goalscoring start after his £27 million move from Wolfsburg back in January 2011 saw the eastern European forward go without hitting the back of the net until late April, and had the club’s fans questioning his purchase. However, a blistering start to 2011-12 saw Dzeko leading the City line and scoring important goals to power the club into title contention. The 26-year-old bagged four goals in the 5-1 demolition of Tottenham at White Hart Lane, and scored twice against rivals Manchester United in the 6-1 derby rout at Old Trafford. There is no doubt of Dzeko quality, if he is given a run of games and is in the right mindframe. Strong, mobile and good in the air, the Bosnian has proven that he can score goals in the Premier League. Roberto Mancini will want four strikers at his disposal, and Dzeko would certainly provide an able deputy to the Argentinean pair and a man to throw on if your team is in search of a goal. However, amongst a squad of big egos and personalities, Dzeko’s attitude, or lack of it, can go unnoticed. On a fateful night in Munich when Tevez refused to come off the Allianz Arena bench, Dzeko had started the game but cut a petulant and abusive figure when removed by Mancini in the second half – this was slipped under the carpet in light of Tevez’s misdemeanour. On numerous other occasions this term Dzeko has made his frustrations clear, and he is clearly not a fan of the squad-rotation system. The Bosnian seems to need to be the main man, like he is at international level, to excel, and constantly being in and out of the team breeds frustration and inconsistency. With Aguero, Tevez and Balotelli all stating that they want to stay with City over the last fortnight, it is evident that there is no room for Dzeko. 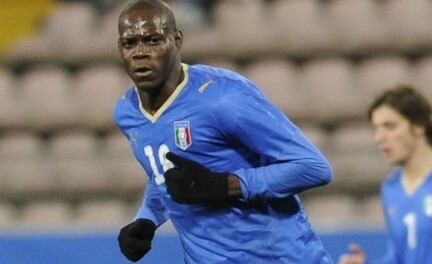 Mancini would like to keep him, but will not play him enough to satisfy the player. Bayern Munich and Borussia Dormund have been credited with an interest, but City are set to make a considerable loss on their initial £27 million investment. One feels that Dzeko has been a victim of City’s style and personnel, with Tevez, Aguero, David Silva and Samir Nasri all smaller players that want the ball to feet and to knit intricate interplay. The bullish Dzeko is seemingly not an ideal fit to the Premier League leaders, and will most likely be sold at a discount price by City this summer with the Financial Fair Play ruling in mind. Who is to blame for the Manchester City blue moon falling? After the Premier League games on March 4th, Manchester City had a two-point lead over Manchester United and an 11 goal advantage in terms of goal difference. Now just over one month later, after their 1-0 defeat to Arsenal they found themselves eight points and two goals behind. Who is to blame for this though? A lot of the attention over the last week has been around Mario Balotelli. There is no doubt that the circus that surrounds Balotelli does not help the team spirit or the harmony of the team when they are on the pitch. His constant neglect of his defensive duties was evident against Arsenal when his unwillingness to defend resulted in constant Arsenal pressure down Manchester City’s left hand side for the first 25 minutes on Sunday. His temper also lets his team down. Balotelli should have been sent off early on against Arsenal for a horrific tackle on Alex Song and of course has already been sent off against Liverpool earlier in the season and was lucky to get away with a cowardly kick out at Scott Parker in the home meeting with Tottenham. There is no doubt though that Balotelli possesses ability. His record this season of 17 goals in 31 games in all competitions shows that he has potential and his calmness from the penalty spot is to be admired. However until he learns to control his temper and improve his team play he will always cost whichever team he plays for more points than he gains them. The other player who must take a portion of the blame is Carlos Tevez. His record before the start of this season of 52 goals in 81 games for City was outstanding and his ability to create something out of nothing for himself or for his teammates made him one of the most feared strikers in the league. His refusal to warm up against Bayern Munich in the Champions League would once again have done nothing for harmony in the dressing room. His constant refusal to apologise whilst trying to engineer a move away from the club for the last 6 months would have left a bitter taste in his fellow player’s mouths whilst they were trying to win a title for the supporters. 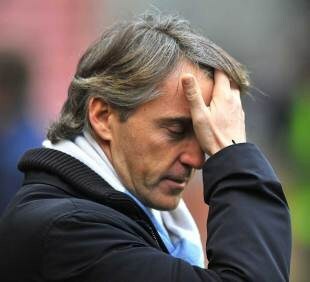 The man who must take the most blame for city’s capitulation in the title race is Roberto Mancini. 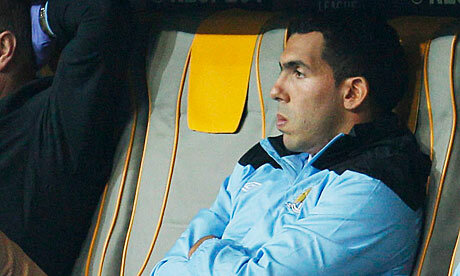 Whilst Balotelli and Tevez have both acted unprofessionally he is to blame for giving them both too many chances. Tevez should never have been allowed back in the dressing room after effectively going on strike for the majority of the season and after Mancini said he would never play again. Mancini seemingly has no Plan B in his locker either. He is far too negative away from home and this has resulted in defeats against Arsenal, Swansea, Sunderland and Everton. Opposition teams have worked out that if you cut off David Silva’s space then Manchester City do not move the ball quickly enough to hurt you. There is clearly no team spirit in the dressing room which also comes from the manager with players constantly arguing and bickering on the pitch with each other. This is the main reason why City have blown their chance at the title. Whilst even many Manchester United fans would admit City have better players, United are more of a team and have the winning mentality which comes from their manager. The buck always stops with the man in charge and that is why Mancini may well find himself out of a job in just over a month’s time and City will need a new man to get the blue moon rising once again. Despite the common trait of footballers being poor role models and lacking integrity, some players and their backgrounds can inspire you. The majority of footballers have an enviable life and everything they could ever imagine on a silver platter, but these combatants have had to overcome adversity to play the beautiful game. Ivan Klasnic is the first and still the only player to compete in a major competition after recovering from an organ transplant, going against medical advice to play at Euro 2008 for Croatia. The Bolton attacker was diagnosed with kidney failure in January 2007, which threatened the striker’s life – never mind his football career. However he has come back stronger than ever, and shown incredible will to win to return to action. Widely regarded as one of the best wingers ever to play the game, Garrincha was a World Cup winner in 1958 and 1962, playing in the same Brazil team as Pele. The South American’s achievements are made all the more impressive given the fact that his spine was deformed, his right leg bent inwards and his left leg six centimetres shorter and curved outwards from birth. Salvador Cabanas was regarded as one of South America’s most clinical goalscorers of the 2000′s, but the forward’s life was turned upside down on 25th January 2010, as he was shot in the head in a Mexico City nightclub by notorious drug lord Jose Balderas Garza. Defying medical opinion Cabanas has returned to living a normal life, and even stepped out to feature in an exhibition game between the Paraguay national team and old club America in 2011. A German World War II veteran, Trautmann signed for Manchester City in 1949, and suffered a serious neck injury in the 1956 FA Cup final. After a challenge with a Birmingham attacker, the goalkeeper suffered a broken neck, but still played the remainder of the game to see City win the trophy 3-1, making all-important saves along the way. Whilst playing for Vicenza in Italy back in December 2005, Julio Gonzalez was involved in a high impact car crash when travelling to Venice airport. After being hospitalised for a month in Europe, doctors were forced to amputate the Paraguay international’s left arm. 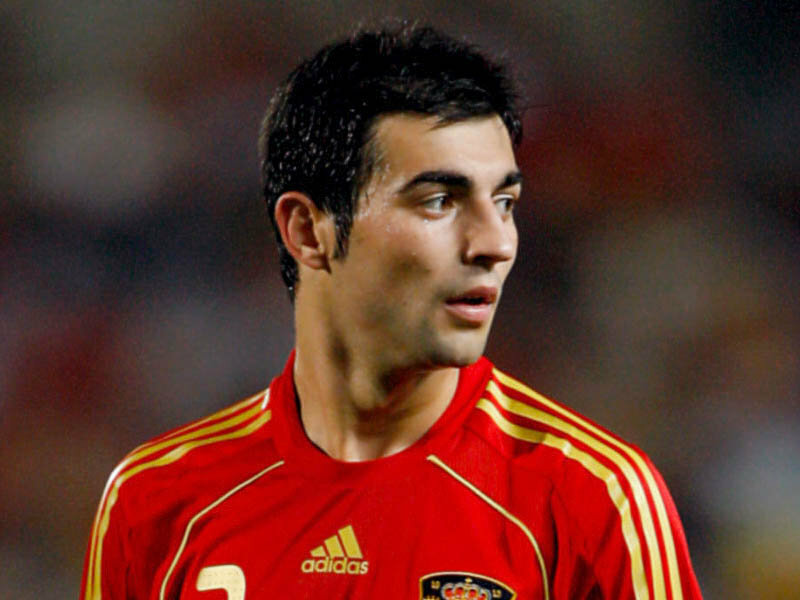 Despite losing the ability to play at the highest level, Gonzalez has remains an important member of the football community in his country, and in 2008 opened an Inter Milan football academy in the South American nation. The current Ballon d’Or holder was diagnosed with a growth hormone deficiency whilst a child, and moved to Barcelona’s La Masia youth set up before becoming the best player in the current game. Balotelli had life-threatening complications with his intestines shortly after birth, which led to a series of operations and him being fostered at the age of three. Both eastern European footballers have suffered a skull fracture during their career, Chivu in 2009, Cech in 2006. The Chelsea goalkeeper’s condition became the more serious of the two, with Cech wearing protective headwear whilst competing ever since. Twenty-three of the 43 passengers on board the Elizabethan charter aircraft G-ALZU ‘Lord Burghley’ lost their lives in the Munich Air Disaster on Thursday 6th February 1958. Nine other footballers and the manager, Matt Busby, were injured in the crash and while many of them could not play again or reach the heights before the crash, the achievements of Sir Matt Busby in rebuilding Manchester United as a force in England and Europe are the stuff of legend. Not to mention Bobby Charlton’s star-studded career for United after surviving the crash at the age of 20. Whilst driving to a game in 1948, Robert Schlienz let his arm hang out of his car window, only to be involved in a crash. His vehicle overturned and his arm was damaged beyond repair, forcing amputation. 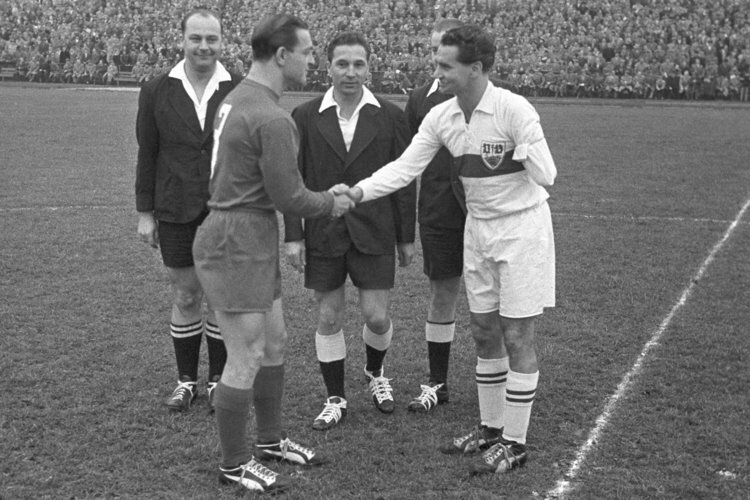 Despite the setback, he went on to become captain of Stuttgart, winning two national championships, and played three games for Germany – all with one arm. Born to Ghanian parents Thomas and Rose Barwuah, Balotelli had a life-threatening intestinal illness as a child that he survived. Taken into the care of Francesco and Silvia Balotelli at the age of three, Balotelli accused his biological parents of ‘glory hunting’ when they tried to make contact with him after he became a professional footballer. Signed for Inter back in 2006 from Serie C side Lumezzane, Balotelli had a trial at Barcelona at the age of 15 but did not make the grade. Made 59 appearances for Inter, scoring 20 goals. Won three Serie A championships, one Coppa Italia, one Supercoppa Italiana and the Champions League in 2009-10. Infuriated Inter fans when he wore an AC Milan shirt in a television interview, was reportedly seen shopping in the AC Milan superstore, and his numerous fallings out with Jose Mourinho blighted his time at the San Siro. 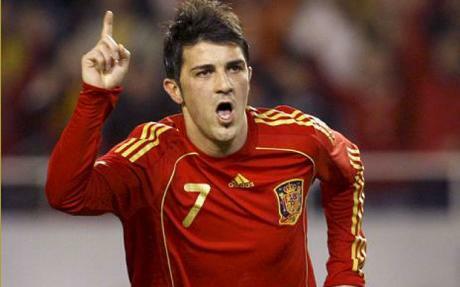 Moved to Manchester City in August 2010 for a fee of £24 million, following Roberto Mancini to England. ‘Mad Mario’ has been involved in a raft of motoring incidents; he has been fined £10,000 in parking fines during his time in the United Kingdom, has had his car impounded 27 times and crashed his Maserati sports car within days of having it imported from Italy. Turned the backyard of his English mansion into a quad bike track. Balotelli is not shy when it comes to flashing the cash; when pulled over police the striker had £5000 in his wallet. When asked why he was carrying so much money by the police officer he replied: “Because I am rich.” In December 2011 he dressed up as Santa and handed out money on the streets of Manchester; the same month Balotelli also donated £200 to his local church, before paying for a £1000 round in a bar the same day. 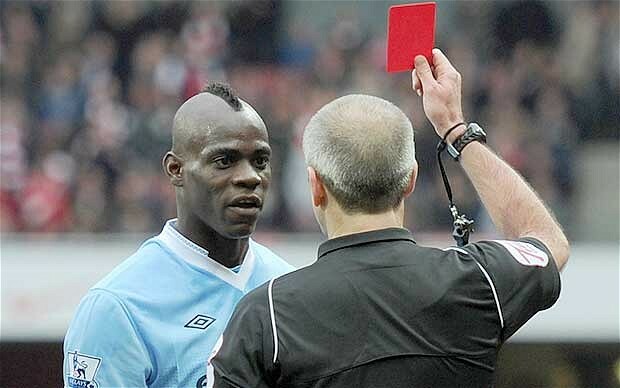 Disciplinary matters have blighted his career – Balotelli has been sent off against West Brom, Dinamo Kiev and Liverpool. Fined £100,000 for throwing a dart at a City youth player. Let off fireworks in his house the night before a Manchester derby, before becoming an ambassador for firework safety. Broke a curfew before a game against Chelsea to go to a local curry house, where he was involved in a mock sword-fight using rolling pins. Scored in the said Manchester derby and unveiled a t-shirt with ‘Why Always Me?’ on it; City went on to win 6-1 at Old Trafford. Has been involved in training ground bust-ups with Vincent Kompany, Jerome Boateng, Carlos Tevez and most recently Micah Richards. After City won the FA Cup in 2011, Balotelli said: “This season I have been s***. Can I say that?”, on live television. After he won the European Golden Boy trophy in 2010, Balotelli claimed to have never heard of runner up Jack Wilshere and stated that Lionel Messi was the only player in the world better than him. Incensed Roberto Mancini by trying an audacious pirouette finish when through on goal in friendly match against LA Galaxy in the United States; was instantly substituted. 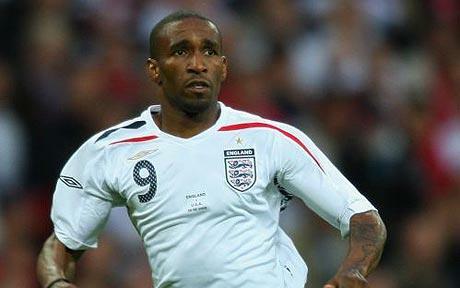 Made his international debut against Ivory Coast in August 2010. Was spotted using his iPad on the Italy bench in a game against the Faroe Islands. Was summoned in September 2011 to give evidence in a high-profile Mafia court case in Italy. 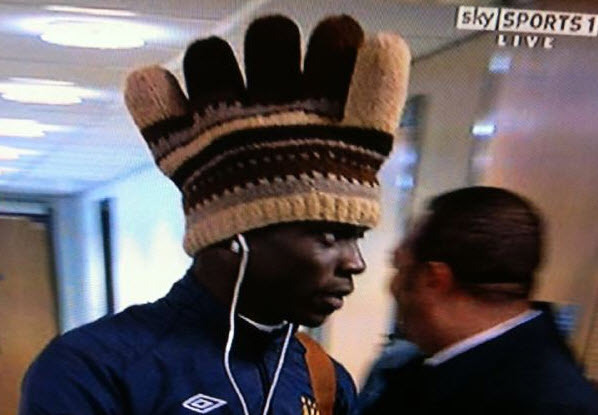 Super Mario is becoming an ever-more important member of Manchester City’s squad, and his talent in undeniable. 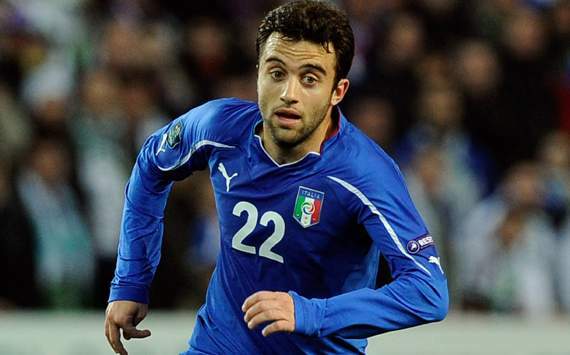 On the international scene, he seems to be in Cesare Prandelli’s preferences currently, and is set to star for Italy at Euro 2012 this summer. However, most football fans are captivated by the Italian’s unorthodox behaviour away from the game, with the above list set to grow in years to come.